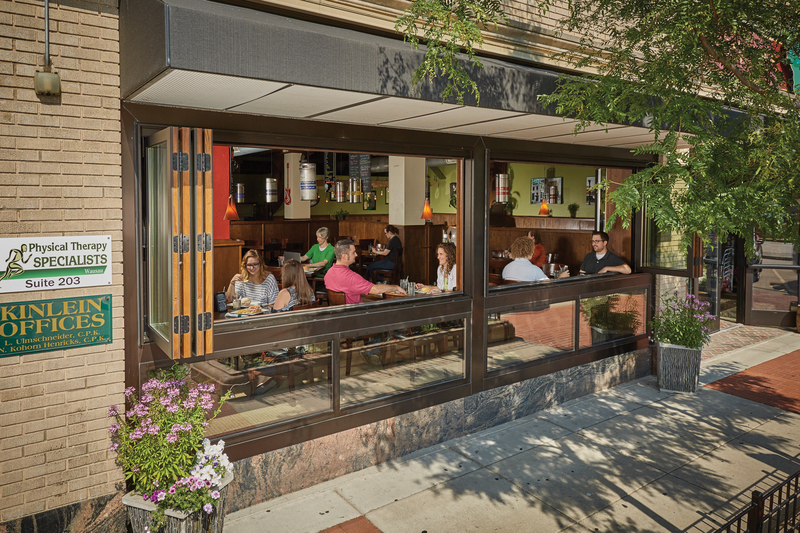 Enhancing the vibrant atmosphere of Malarkey's Pub and Townies Grill in historic downtown Wausau, Wisconsin, Kolbe Ultra Series Folding Windows match the traditional architecture, offer modern performance and offer restaurant guests prime views. One year after Wausau was organized as a town in Wisconsin, Courthouse Square was purchased for $100 in 1853. The location was home to the area's courthouses for over a century and served as mixed-use property for another half-century. In 2002, the square was cleared to become green space and gathering space for community events. The newly purposed square positively transformed the views and street life of the historic buildings surrounding it. These include nine surviving structures built between 1874 and 1941, such as the 1924 Hotel Wausau in Classical Revival style, the 1927 Grand Theatre in restored Neo-Classical Revival style, and the 1929 Mayer-Lotz building in the Chicago Commercial style. For the first time in these properties' long lives, their occupants could more deeply appreciate their architectural heritage, the open Courthouse Square and a reemerging downtown destination. Located on the street level of the old Mayer-Lotz building, the new building co-owners, Kurt Kraimer and Ed Kraimer of GK 408 3rd St. LLC, saw an opportunity to foster a greater connection to the activity and to draw more patrons inside Malarkey's Pub and Townies Grill. Given its proximity to the theater, the old Mayer-Lotz building is often called "Grand View" by Wausau's residents. 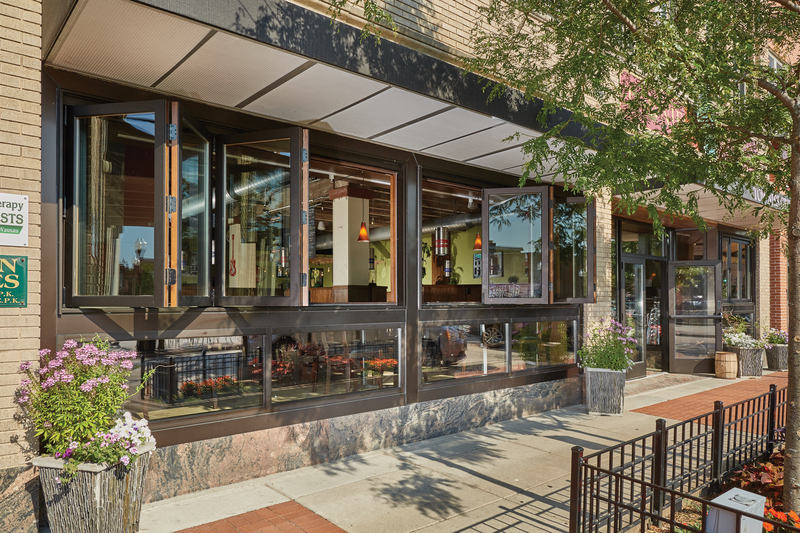 Thanks to a storefront update using Kolbe's Ultra Series folding windows, the restaurant guests now truly have a grand view. "Everyone wants to sit by the windows. 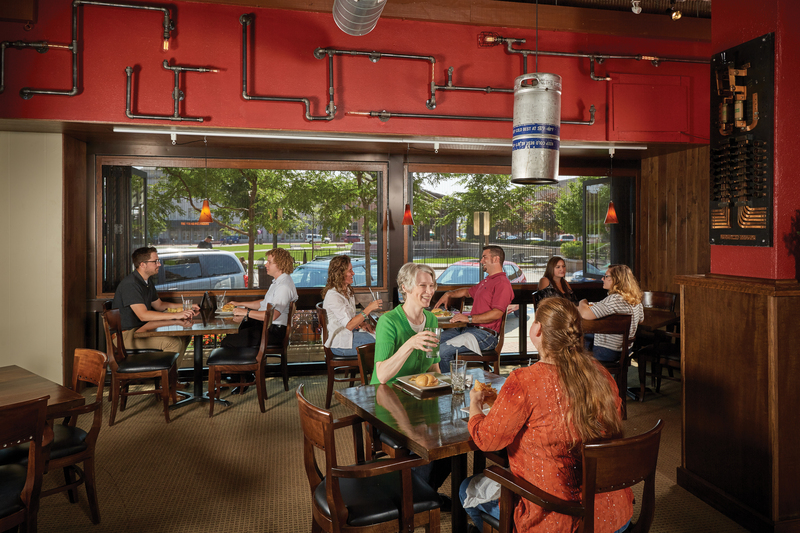 It's the #1 question asked at our hostess station," says Tyler Vogt, co-owner of Malarkey's. "The windows definitely give our place a more modern, big city feel with a connection to the activities Downtown." "It creates a very unique atmosphere, something we have been working on for a long time and it turned out fantastic," praises Kurt Kraimer. The Mayer-Lotz building that houses Malarkey's features a touch of Art Deco near the roofline, geometric capitals and engraved columns. Capturing the traditional look, while offering modern performance, each of the four Kolbe folding windows is crafted with a different configuration to maximize views. Beveled glazing beads accentuate the historic aesthetic. For Malarkey's, the windows' exteriors are clad in low-maintenance extruded aluminum finished a durable Dark Bronze anodize. On the interior, oak wood is stained in a Chestnut color. Precision Glass and Door installed Malarkey's new Kolbe windows, as well as additional components for the entrance and vestibule. "It's a great facelift," echoes Don Turzinski, owner of Precision Glass. "Before, you could go by it almost without noticing. Now, you want to stop and go inside." Turzinski offers additional praise, saying, "Kolbe was great to work with. They helped pretty much every step of the way, from shop drawings through installation. They even came down to help us as we were putting the windows in."